In an interview with the Central City News, Central High head football coach Sid Edwards reminisced about the decade since the City of Central incorporated on July 11, 2005. 1. Miracle at Metairie. In the playoffs in 2008, Central High faced Brother Martin on a freezing night in Metairie. With the State Regional Championship on the line, it was a classic defensive battle. In the first half, each team scored once and it was tied 7-7. By the 4th quarter, Brother Martin running back Dalton Hilliard, Jr., was running through the Central defense almost at will. With 16 seconds left in the game, Brother Martin had first-and-goal at the 9-yard-line. A Brother Martin victory seemed almost certain. They had time for one running play to try to score a touchdown. Then, if that failed, they could call time out and try the field goal. The worst that could happen for Brother Martin would be to miss the field goal, end the game in a tie, and go into overtime. Or so it seemed. The Crusader quarterback handed off to Dante Butler, who had also been shredding the Central defense. But, whoaa, he was thrown for a 14-yard loss by Travis Watts back to Central’s 23-yard-line. With five seconds left on the clock, Brother Martin’s field goal unit came onto the field. The ball was snapped, kicked, and sailed toward the goal posts. No, wait… it was blocked! Who was that? It was Josh Johns who blocked it! The ball was up in the air somewhere around the 30 yard line. Josh Veals caught the ball on the fly and took off running for the goal line. As Veals passed the Wildcat 40-yard-line, Coach Edwards said, “I lost sight of what was going on. Everybody was pushing and jumping up and down. The next thing I saw was a big pile of Central players down in the end zone. I’m thinking, well, we must have won this thing!” Players flooded onto the field. The clock had run out, and no attempt was made to kick the extra point. The Central Wildcats had won the State Regional Championship 13-7 — all because of the Miracle at Metairie, the game of the decade! 2. Catch in the Cathouse. Central fans and players believed there would never be a game to match the Miracle at Metairie — until the next year, when something just as astounding happened! On the cold evening of Nov. 20, 2009, at Wildcat Stadium, Central hosted the Ouachita Lions, one of the top teams from North Louisiana, for the Bi-District Championship. Ouachita’s quarterback was reputed to be better than Terrance Broadway, and the previous week the Ouachita defense sacked the West Jefferson quarterback nine times. In the Old Testament, Daniel was thrown into a den of lions to test the power of his God. And, in this game, like Daniel of old, Daniel Hebert and his Central team emerged victorious after 48 minutes with the Ouachita Lions. With 1.6 seconds on the clock and facing a 28-23 loss, Central quarterback Will Briscoe threw a 50-yard ‘Hail Mary’ pass to the end zone, where it was easily batted down by four Ouachita defenders. But there in the right place at the right time was Daniel Hebert, normally a defensive safety, who caught the ball before it hit the ground. He plowed in for the touchdown and a 29-28 victory for the Bi-District 5A Championship. 3. No. 32 Seed Defeats No. 1 Seed in Playoffs. The 2011 State 5A Championship was clearly St. Paul’s to lose. They were the best team in the state, ranked No. 1 in the polls and seeded No. 1 in the playoffs. But they didn’t take account of the Central Wildcats, the No. 32 seed in the first round of the state playoffs. Actually, Central wasn’t the No. 32 seed. They were No. 33 and pushed No. 32 Chalmette out of a playoff spot by virtue of being the District 4-5A Champion. On game night, St. Paul’s dream of a State Championship turned into a nightmare, as Central jumped to a 21-0 lead. St. Paul’s fought back and led 28-27 before Wildcat quarterback Brett Courville engineered an 80-yard drive, ending with a 1-yard touchdown by Zack Evans and a two-point conversion by Jake Myer with 1:04 left. It was a sweet 35-28 victory for Coach Doug Dotson and the Wildcats and more than avenged two regular season losses to St. Paul’s the past two seasons. 4. Defeating Mighty West Monroe 14-0. Central won the State Regional 5A Championship in 2013, defeating West Monroe 14-0, the first home field playoff lost by West Monroe in decades. 5. Defeated Defending State Champion Acadiana 10-7 in 2008. 6. Five Straight Victories Over Catholic High including a 60-21 victory in 2009 before the Bears abandoned District 4-5A. 7. Central’s Victory Over St. Thomas More in 2013. 8. Defeating Scotlandville for Three Straight Years by 1 Point in 2011-2012-2013. 9. Overtime Victory Over Denham Springs in 2011. 10. 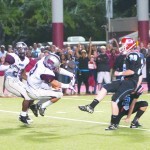 Central’s Overtime Victory Over Zachary in 2010 when Cooper Moore intercepted in the end zone to end the game.